Join me as I visited the Japan Pavilion at Fancy Food Show in San Francisco for unique ingredients and flavors. And guess whom I met! Winter Fancy Food Show is the largest trade show devoted exclusively to specialty foods and beverages on the West Coast. 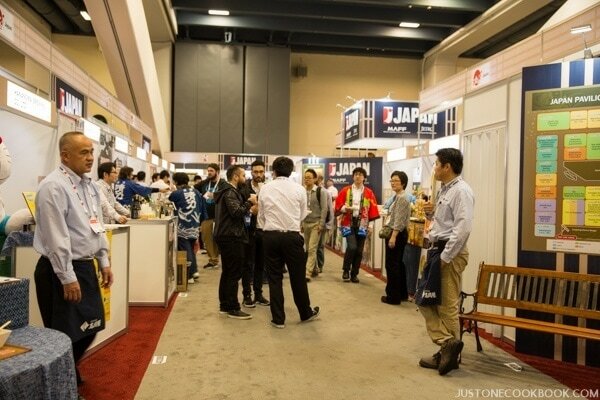 One of the largest international showing there was from Japan featuring various Japanese food products and ingredients. 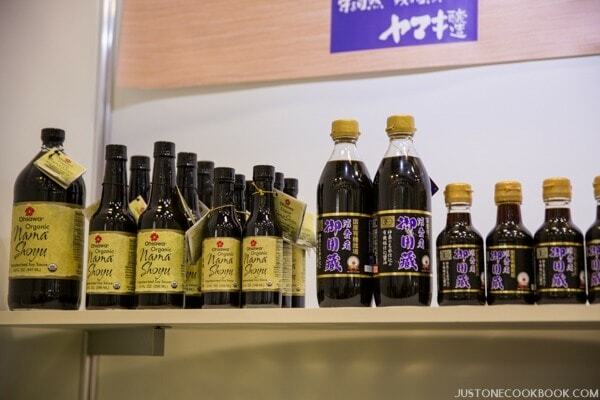 The Japan Pavilion featured wagyu beef, premium sake, Japanese condiments, and unique products like gluten free ramen from the exhibitors. 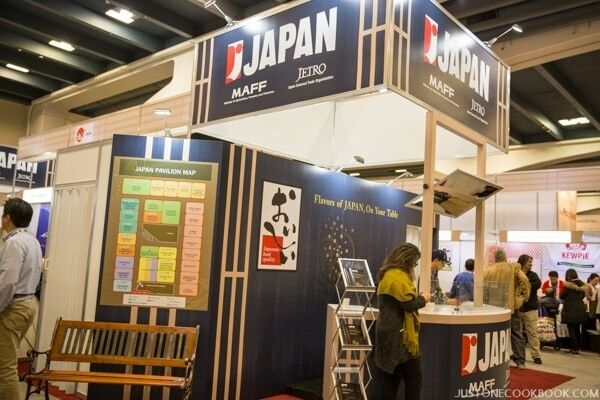 Japan External Trading Organization (JETRO) kindly invited me to attend the Fancy Food Show this year and as well as the Preview Tasting event. 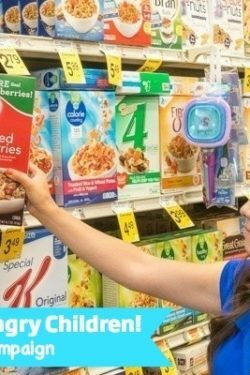 My goal was to learn more about the new products coming from Japan and share them with my readers. Let’s start from the Preview Tasting party. 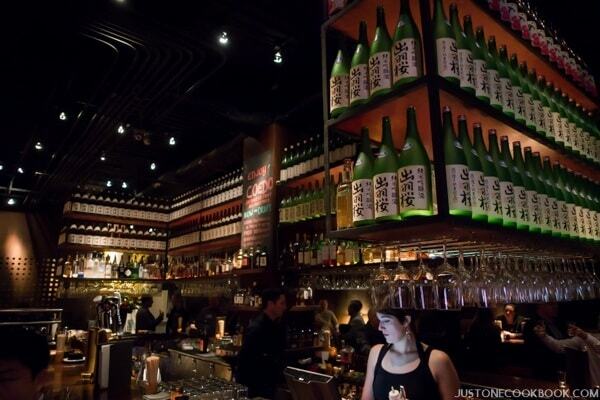 The party was held at Ozumo, a trendy Japanese restaurant in San Francisco. Chef Sho Kamio from Iyasare in Berkeley was the chef in charge featuring 14 mini bite course meals using the ingredients from exhibitors for Japan Pavilion in Fancy Food Show. 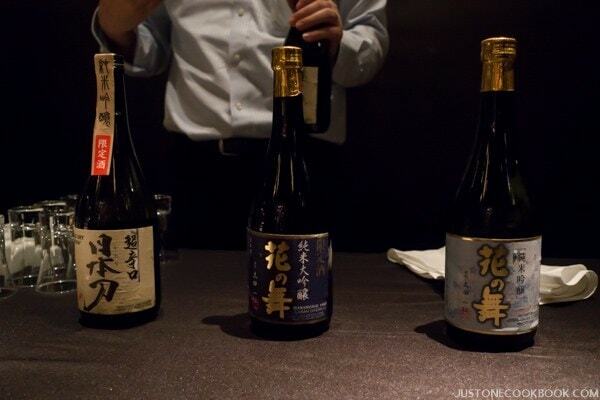 The night started off with the tasty sake from Hokkaido, Iki Junmai Daiginjo. Then tasting 3 different kinds of sake, Katana Junmai Ginjo (left), Hananomai Junmai Daiginjo (center) and Hananomai Junmai Ginjo and they were super smooth and flavorful. 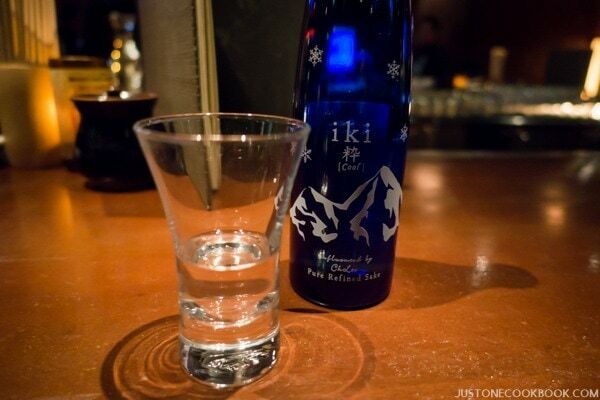 With Iki sake, they polish more 50% of the rice and the result is simply amazing. We started with Seasonal Sunomono with burdock root, Hawaiian Kampachi with gold sesame oil, Japanese Farmer Style Vegetarian Miso Soup with millet konnyaku noodle, and Blue Fin Toro Tartare with edamame puree and rice chips. 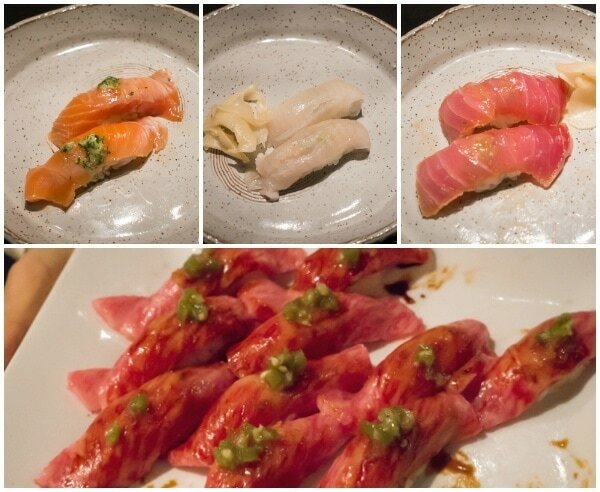 We also have several kinds of Nigiri Sushi including salmon, kanpachi, tuna, and Kagoshima Wagyu Beef. 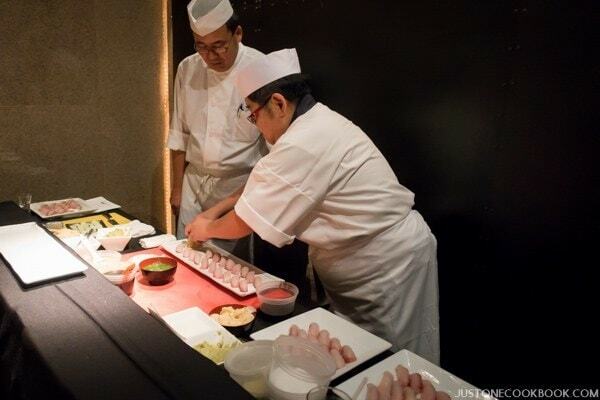 The sushi was made right at the party by sushi chefs with real wasabi. Next, we have Hokkaido Scallop with ikura, Japanese sea urchin, and hon wasabi, Grilled Portobello & Kabu Turnip with miso turnip puree and garlic soy sauce, Satsuma Beef Sukiyaki Roll with tamari soy sauce, and Spicy Mentaiko Fettuccine with gluten free noodle fettuccine and Japanese mayonnaise. 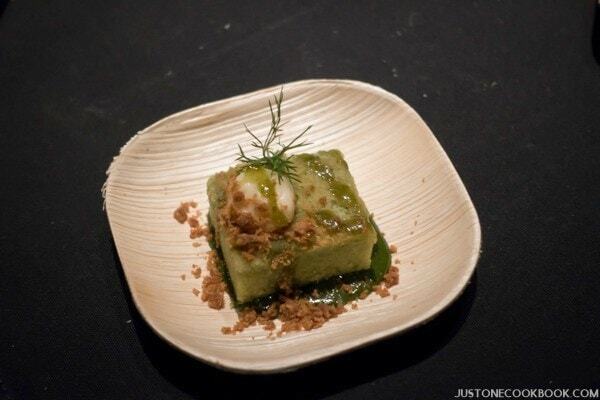 We ended the meal with Matcha Tea Cake with kinako crumble and sweet miso cream. All in all, this special tasting menu prepared by Chef Sho Kamino was wonderful! I couldn’t wait to learn more about the ingredients used in these dishes at the Japanese Pavilion at Fancy Food Show the following days. Japan Pavilion was one of 5 largest international gallery among 28 countries attended. Above picture has a floor map that indicates each booth location with the exhibitor’s name. I did my best to take pictures while tasting samples and listening to the exhibitors’ stories behind the products. 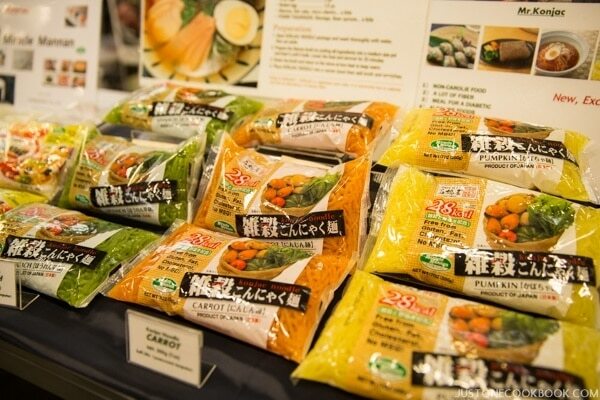 Since I didn’t have enough time to stop by every booth, I will feature some of the Japanese ingredients/products that caught my attention in this post. Japanese use konnyaku (konjac) in cooking often, whether it’s in oden or simmered dishes or soup. In recent years, konnyaku noodles are getting more poplar especially oversea for healthy diet and as a replacement as gluten free noodles. Ishibashiya‘s konnyaku noodles can be used to replace your pasta, ramen noodles, or stir fried noodles. 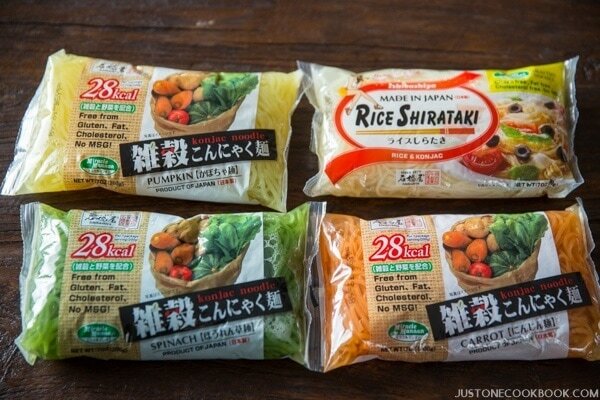 It comes in different natural flavors, kabocha pumpkin squash, spinach, and carrot flavors, and they also have Rice shirataki noodles made of rice and konnyaku. The konnyaku noodles are low in calories and rich in calcium and fiber! If you have wheat allergies, you can still enjoy your your pasta, ramen noodles, or stir fried noodles with these konnyaku noodles! I was so excited to see the Japanese rice company Sumidaya at the Fancy Food Show. 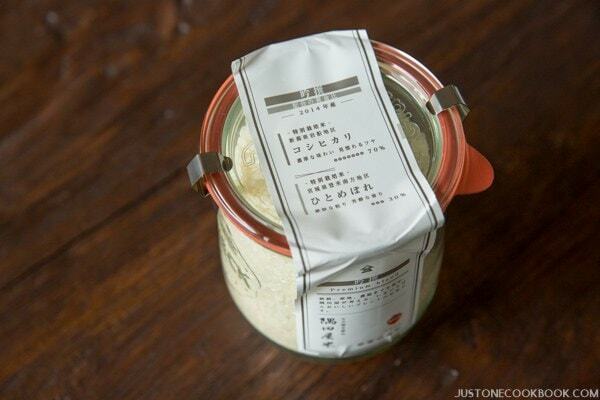 Their simple and clean packaging for the rice caught my attention. 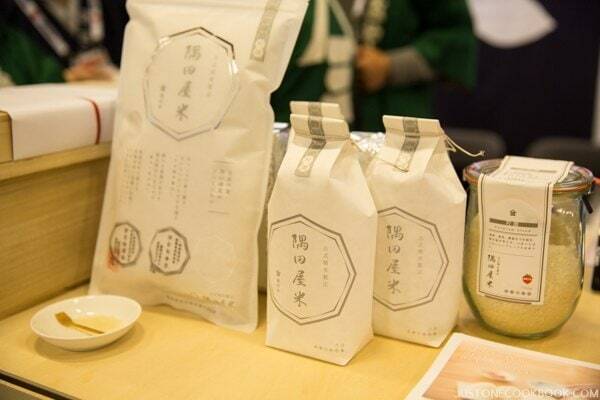 Sumidaya selects and blends rice from different regions during the harvest time. 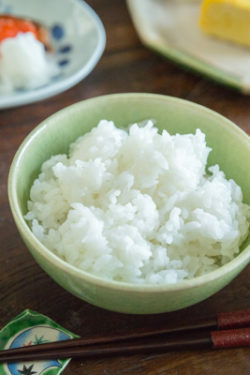 This premium blend rice consists of 70% Koshihikari rice from Niigata prefecture and 30% Hitomebore rice in Miyagi prefecture. I was gifted this special blend rice (which is also available at selected Nijiya locations) and I can’t wait to make steamed rice that came all the way from Japan! As we have saying, when you have delicious rice, you don’t need main dish. All you need is good rice and pickles! I received some samples from Hokkai Yamato, a company based in Hokkaido. This instant soup mix has no dairy, no MSG, and no GMO. They are trying to bring Corn Soup, Kabocha Soup, and Tomato Soup to the American supermarket soon. 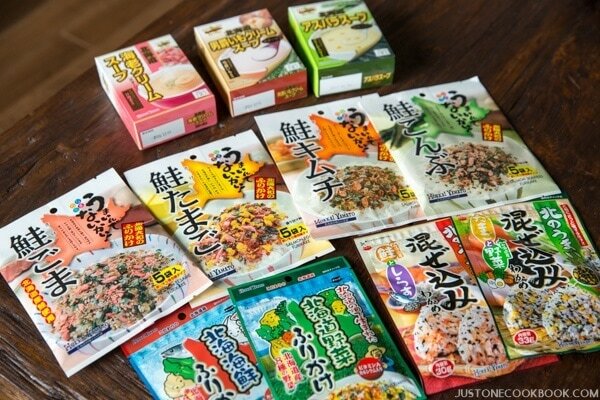 I also received all kinds of Furikake made with Hokkaido produces! 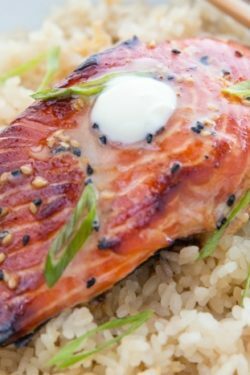 Rice seasoning made with salmon sesame seeds, salmon tamago, salmon kimchi, salmon kombu… as you probably guessed, Hokkaido is known for delicious salmon. I look forward to trying these varieties soon. 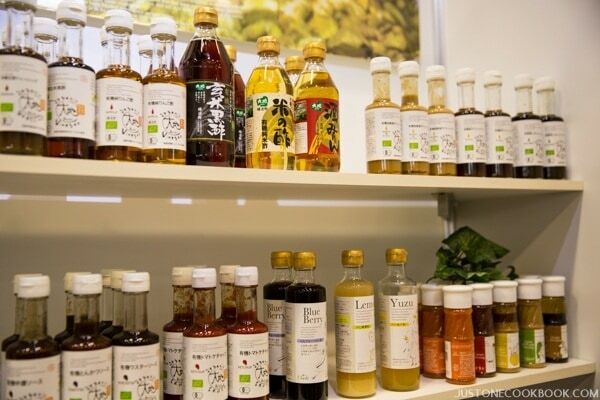 Yamaki Jozo produces soy sauce, miso, and tofu with domestic organic soybeans. 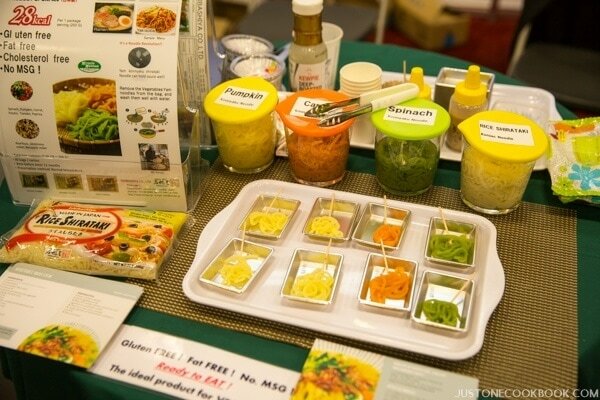 And the next booth was Sennari, a company that makes delicious rice vinegar from organic rice. And the best part at these two booths? 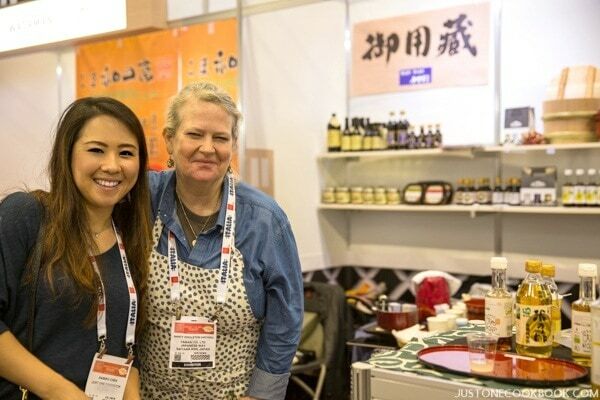 Nancy Singleton Hachisu, a Japanese food guru and author of “Japanese Farm Food” and “Preserving the Japanese Way“, was inside the booth! I said “Nancy! ?” with excited voice, and she looked up and recognized me with a big smile. She was helping out Yamaki Jozo which is based in her town in northern Saitama prefecture. What a surprise! Nancy let me try all kinds of samples from these two companies. I tried delicious tofu that is so silky and smooth. I had a few samples of different rice vinegar and a salad with yummy dressing. The yuzu concentrate was amazing! 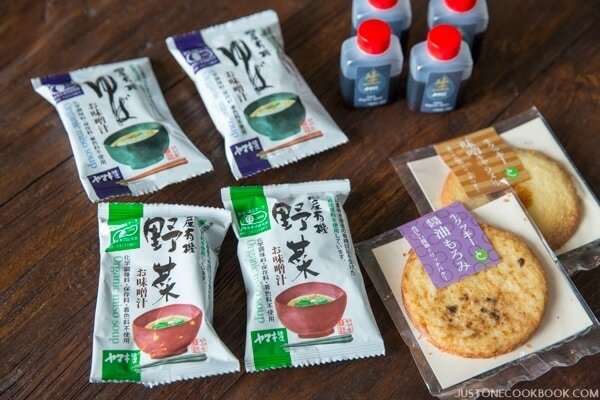 I also tasted the instant miso soup (the package you see below), which Nancy brings on her international business trips (great idea!). The cookies with miso and soy sauce were phenomenal! Nancy sent me home with more products which I can’t wait to try! 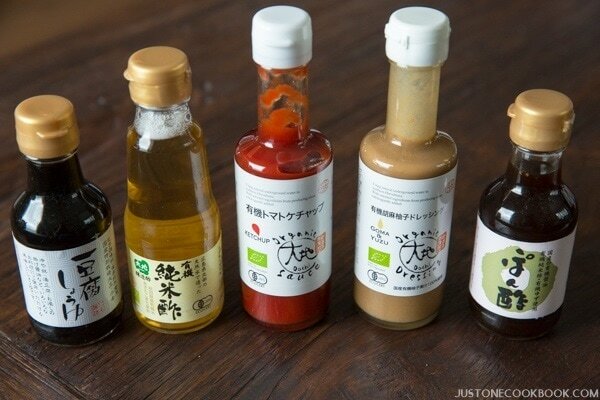 Soy sauce, miso, tofu, rice vinegar… these are essential in Japanese cuisine. 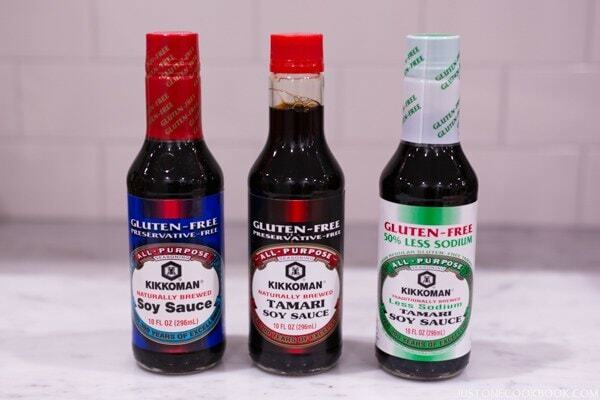 However, living outside of Japan, we usually don’t have an option to pick our favorite condiments from Japan as Japanese grocery stores only carry 1-3 big-name brands of one product. Hopefully one day, we get to see more unique products from these smaller companies in the US. Finally, here’s my answer to all of your gluten free noodles inquiries! Kobayashi Noodle makes gluten-free Udon noodles, ramen noodles, soba noodles, Fettuccine noodles, and brown rice Fettuccine! When I found out about these noodles last year at Fancy Food Show, I tried all of types of noodles from them and they taste amazing! If you’re interested in purchasing, please check here. You can contact the company, and they could also ship from Japan. For more information about products featured in Japan Pavilion at Winter Fancy Food Show 2016, please visit here. 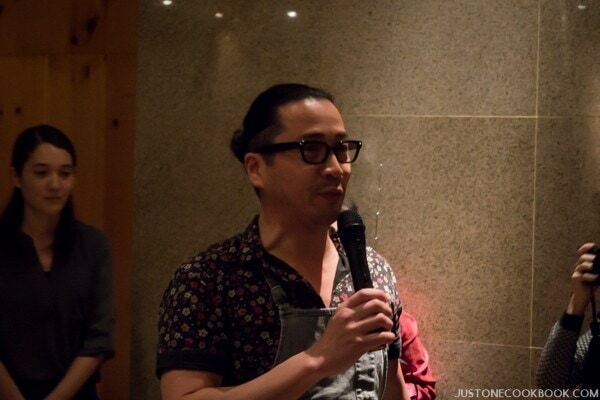 Last but not least, I’d like to thank JETRO for inviting me to the Tasting Party and Fancy Food Show. Oh wow that would have been amazing to see in person! And so nice of her to give you the things to try. I have to be gluten free not by choice, unfortunately and when I saw all those yummy gluten free noodles like the ramen and soba I was like yes please!!!! But did they have gluten free Yakisoba noodles? Thank you so much for sharing this with me. I enjoyed reading about that Food heaven! Hi Tania! Yeah it was such a pleasant surprise! They don’t have Yakisoba noodles. Wonder curly miso ramen noodles from Kobayashi would work for yakisoba… Undercook noodles a bit and stir fry. But it might gets mushy… Konnyaku noodles are another option, but I know it’s not exactly similar in texture, but I liked the taste and texture and I think you might like it with Yakisoba sauce! 🙂 Thank you for reading Tania! Thank you for finding GF noodles, awesome! I don’t eat noodles at all because of celiac, I just haven’t seen some noodles I could use so I just skip this part of food. The only GF noodles I use are soba some soba are GF. But O would like to try så many recipes with udon too! Indeed, “fancy” is a good description for the exhibition. Thanks for sharing information about the products that you saw there. 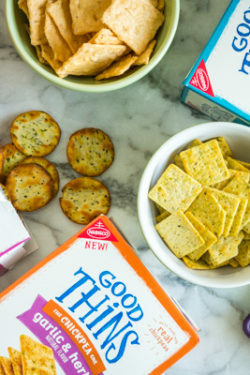 I tend to walk the line between curiosity and caution when updating my pantry, so your thoughts and reviews on the products are certainly helpful. Looks like you had a wonderful time there! Oh Nami this looks like so much fun! So happy that you had this great adventure and thanks for sharing it with us. Oh Nami…we’re super close! I was there the whole time. I wish I knew you’d be there ahead of time 🙂 It was a fun show and that cheese bites (with chocolate, strawberry, pepper, almond, etc.) from Japan are so tasty. Hi Linda! Whaaat, you were there???? I could only go there on Tuesday… next year, we plan!! Oh wow! 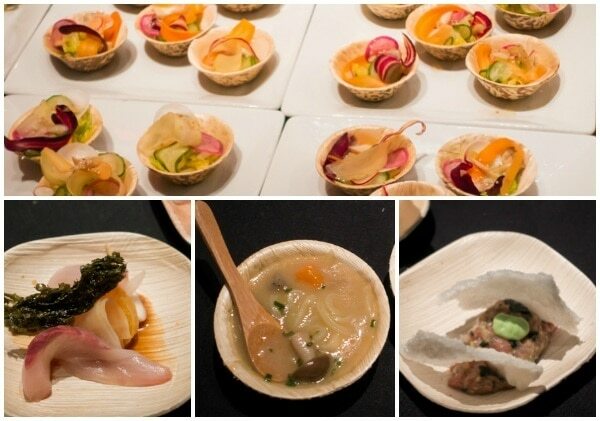 I was not able to attend the Fancy Food Show this year, but seeing the pictures here and on Facebook has made me envious! It certainly is an amazing show. And to meet Nancy Singleton Hachisu – what a treat! None of your email subscription panels are working today! Can you help? Hi Alllan! Mr. JOC and I checked and it’s working for us. I’m so sorry! What happens when you click? Fun and fancy food show indeed. Sounds like a great show! Also sounds like you had a wonderful time. Really informative recap — felt as if I was there. Thanks! Nami. 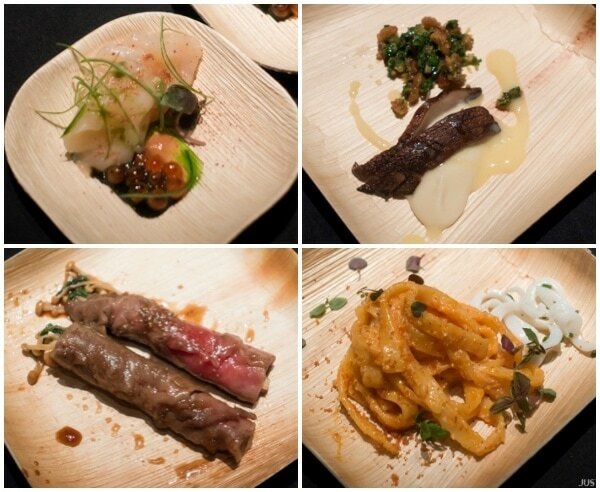 It sounds as if you had a grand time at the food exhibition and really learned quite a bit. Now you can share all that information whenever the new ingredient is in one of your recipes. As always, I look forward to all your recipes and great ideas. I enjoy wearing my Nozomi Project necklace. Hi Chiyo! Thank you for reading my post! I’ll test some recipes with samples I got! 🙂 I’m so happy to hear you like Nozomi Project necklace! Their jewelry is simply beautiful! 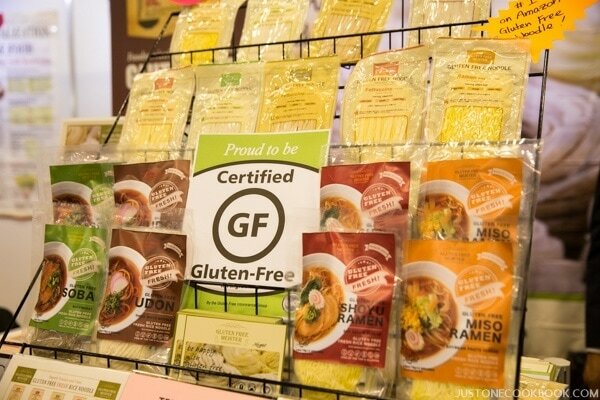 Thank you Nami San for the introduction to the Gluten free noodles….after you kindly sent my son the GF noodles last year, he loves noodles. Of course in Singapore it is difficult to find GF noodles, let alone GF ramen. Now that Kobayashi Noodles makes GF noodles and can export from Japan. I am going to try to order from them. All the food looks fabulous! You can never have too many spaces, you should see my pantry. Wow everything looks so good. I wish we had easy access to many of those things including the Yuzu concentrate. I wanted to ask you what the texture of the matcha tea cake was like? If you thought it was great, I was hoping maybe you could try and come up with a recipe to match that? It sounded SO good, especially with that added extra flair of kinako crumble! (I love kinako). 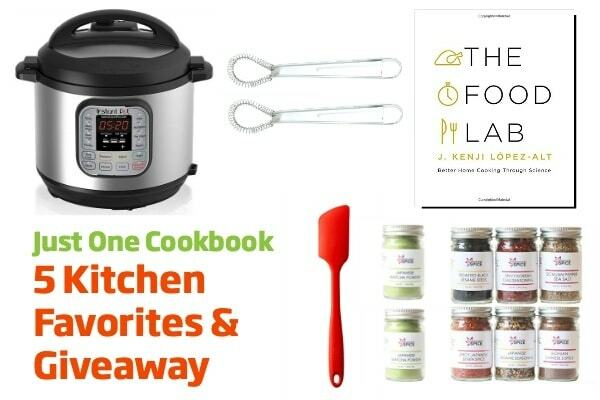 Thank you for your great post! Hi Mai! Yuzu was so delicious. The matcha tea cake was a moist sponge cake with good matcha flavor. The kinako was a nice touch too! I need to try more matcha recipes in the near future! Thank you for writing!